The website template for Businesses who mean Business. Specifically designed for new start-ups, young businesses, sole traders and small organisations, the new Phoenix Lite template is the perfect solution for a solid online presence, at an affordable price. 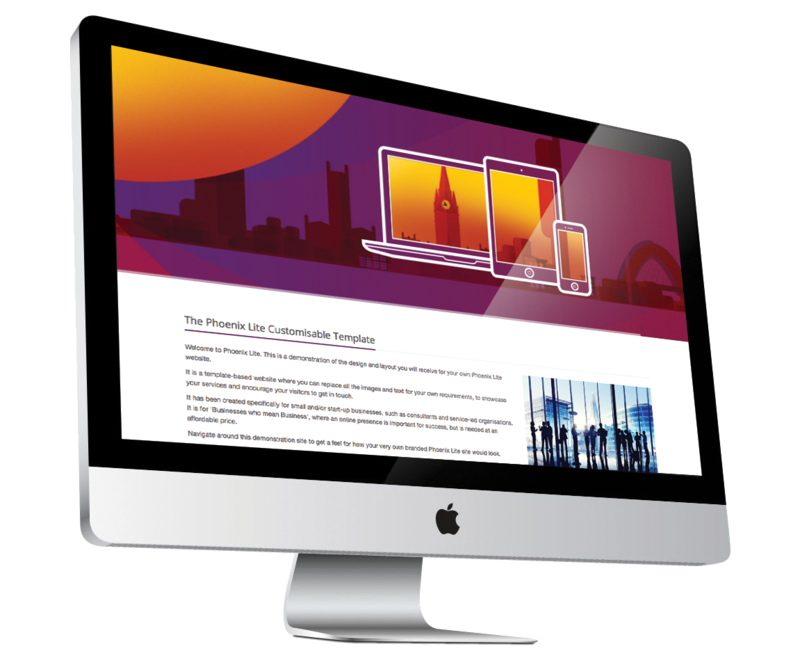 Built by an expert team of developers at Phoenix Digital, a Manchester based digital marketing and web development agency, Phoenix Lite brings powerful features on a customisable template, which is as easy for the novice as the more tech-savvy to keep up to date. Insert your own images and text, select your brand colour and upload your logo. Make it your own and sell your proposition to your customers. It couldn’t be easier to keep your site up to date! The built-in admin panel lets you amend every page and keep your blog and news articles up to date. For Businesses who mean Business, the Phoenix Lite template is available at an affordable one-off cost, with value for money monthly hosting. Send an email straight from your website admin panel to one of our technicians and get help with keeping your site up to date and visible. Need more flexibility? A certain number of extra functions are available at low costs. Take a look at the demo site and imagine your own logo, colour, text and images in place. A professional-looking website for businesses who mean business. It’s amazingly simple to get your own version of the Phoenix Lite website online. Complete the booking form and tell us which features you would like to launch your website with. We’ll contact you to confirm your requirements and take your payment. We’ll set up your site, create you a log in to your admin panel, show you how to insert your own content, and away you go! When you’re all done, click the ‘I’m ready to go live’ button in your admin panel, and leave the rest to us! A professional looking website, built by expert developers, to suit smaller budgets. A number of optional extras to help you get online and get seen by search engines. The Phoenix Lite website template consists of Home page, About, Services, News or Events, Gallery, Blog and a Contact form. Phoenix Lite is brought to you by Phoenix Digital; a Manchester-based digital marketing and web development agency. Specialising in bespoke design and build, we provide tailored solutions for some major brands. Want your own Phoenix Lite website? Simply get in touch with us now by filling in the form below. One of our team will get straight back to you.